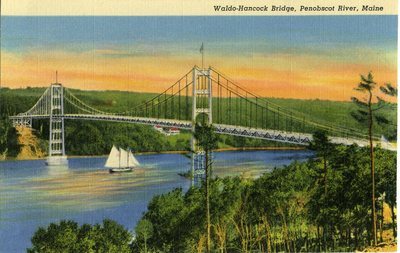 "Waldo - Hancock Bridge Postcard "
An image scanned from a postcard of the Waldo-Hancock Bridge crossing over the Penobscot River. A sail boat is sailing under the bridge and houses on Verona Island appear in the distance. This suspension bridge opened in 1931, was retired when the Penobscot Narrows Bridge opened, with final demolition and removal complete in 2013. The postcard is not dated.